On the same day Theodore Roosevelt narrowly survived an assassination attempt, his press secretary handed him a newspaper editorial from the Iron Ore, a small-town daily located in Michigan's Upper Peninsula. Its publisher, George Newett, had printed, "Roosevelt lies and curses in a most disgusting way; he gets drunk, too, and that not infrequently, and all his intimates know about it." Tired of having his boisterous personality equated with intoxication, Roosevelt angrily shouted, "Let's go at him!" and the paper was formally charged with a suit of libel. 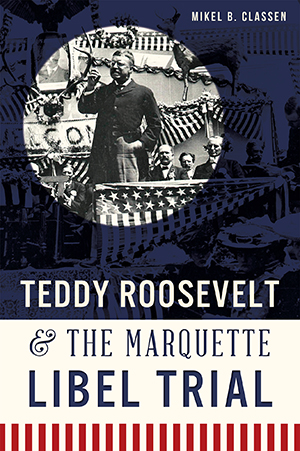 As the case convened, a cadre of admirals, statesmen and fellow explorers descended on Marquette to testify to T.R. 's unimpeachable personal character in the biggest libel trial of the early twentieth century. Mikel B. Classen has been writing about northern Michigan in newspapers and magazines for over thirty-five years, creating feature articles about the life and culture of Michigan's north country. Classen makes his home in the oldest city in Michigan, historic Sault Ste. Marie. To learn more about Mikel B. Classen, check out his website at www.mikelclassen.com.